I’ll be the first to admit that there is MUCH room for growth in my own development as a trader… in terms of knowledge, skill and attitude. In fact, I recognise that it’ll be a life-long journey. One area that has a lot of scope for development is my use of volume analysis. If you’ve been on my site for a while you’ll note that I usually have volume displayed on the lower portion of my charts. In fact, it’s on every chart on my workstation, except for the 1-range. And this naturally leads to a couple of emails a month asking how I use it. It’s been a difficult question to answer, as volume has NEVER been a major part of my analysis background. With much of my trader development occurring in the spot forex market, there was no reliable volume information. However upon moving to futures approximately two years ago reliable volume figures were available, so I added it to the chart and did some introductory reading with the expectation that I would intuitively develop some pattern recognition skills over time. So… where am I at now? Volume is still a very minor part of my analysis. I trade price action. Or more correctly… I trade other trader’s perception of price action (YTC PAT). However volume does offer value as an analysis support tool. So, having been asked again this week I thought I should closely follow my thought processes as I analyse a trading session, to observe when volume plays a significant part, and to once and for all document how I use volume as an analysis support tool. Of course… we can expand on this in future as I develop more insight into volume analysis. Please note… this is just the way I use it. For a more in-depth exploration of the topic, I would recommend researching the fields of Wyckoff Analysis and Volume Spread Analysis (VSA). The primary signal I am looking for is a large and sudden increase in volume. When there isn’t such a signal, I typically place very little emphasis on volume due to too many conflicting or ambiguous signals. A sudden increase in volume attracts my attention. Anything else… I don’t care what it’s doing. Large and sudden increases in volume indicate areas of price action which have attracted a lot of attention from other traders. Price will move from here, proving some of these traders as winners and some as losers. This creates an area of emotion on the chart, which will potentially impact upon future decision making. 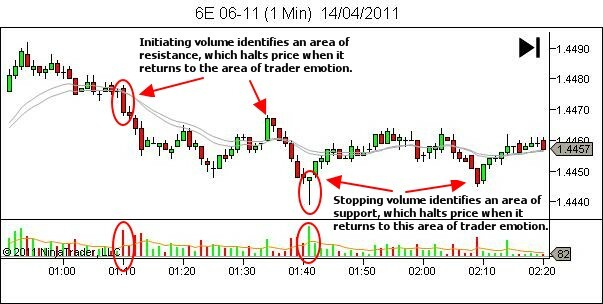 Finding these occurrences of initiating or stopping volume is simply a case of scanning the volume below the price chart. I overlay my volume with an EMA(9). A sudden spike from average volume levels to around twice the average… gets my attention. You should recognise these scenarios most often at key price action areas. For example, initiating volume on a successful breakout, as breakout traders pile in to the market and those trying to fade the move scramble to get out. And stopping volume at the end of a climactic move. You’ll note that all four rules relate to the potential for the area to provide support or resistance, at some time in the future should price ever return there. For the more experienced trader, you may also be able to take advantage of stopping volume right now, through joining the orderflow which helps stop the price move, or joining it as the failure to continue is confirmed. You’ll recognise these occurrences at a test or breakout failure of a support or resistance level. I rarely join initiating volume right now… as that would entail chasing price… usually a big NO in my book. 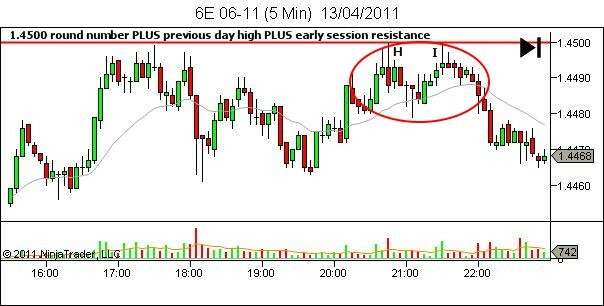 Let’s look at some examples from yesterday’s Euro chart, 13th April 2011. In the above example we have the 5 min chart on the LHS and the 1 min on the RHS, as if using the 5 min as the trading timeframe and the 1 min to obtain finer detail and time entry and exit (YTC PAT style). Point A shows a sudden increase in volume as candle B collapses into the support abeam C. Where did this volume occur though – did it come in at the top of candle B as it broke lower (initiating volume) or towards the end as it hit support (stopping volume)? The one minute chart shows that the greatest volume occurred at the lows (candle D) indicating that this volume consisted of a lot of buying at support (stopping volume). The five minute candle B closed at point E on the one minute chart. Our rule is that a large increase in volume which stops a bearish price move will indentify an area of potential support should price return to this area. This retest occurs one minute later as price moves down to point F. Note the low volume associated with the retest at F, despite the fact that price did break to new lows. If in fact the market sentiment was bearish, then this break lower should have brought in more selling and continued lower. It didn’t do any such thing. The market is finding support at the lows of F, offering an entry long at G as the retest fails. The next example will require separate charts. 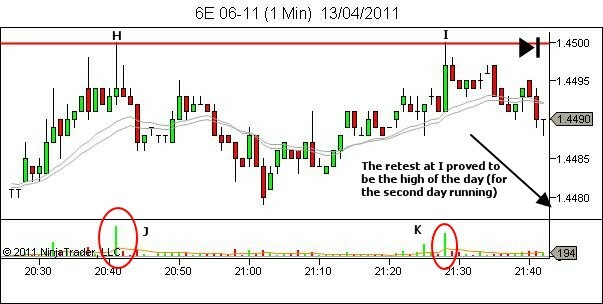 We’ll first display the 5 min chart to identify the area of interest. The 1.4500 level was on our radar as potential resistance due to being (a) the prior day’s high, (b) earlier session resistance, and of course there’s no need to mention it’s a massive round number. The area of interest is within the oval, including the initial test H and then retest I. The following one minute chart zooms in on our area of interest. 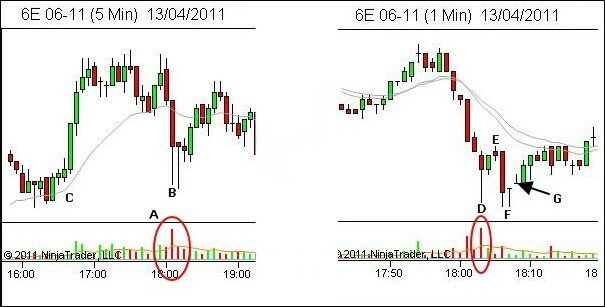 Note this time that the volume expansion is more visible on the one minute timeframe. The highs at H occurred with significant stopping volume J. A nice short was available on failure below candle H.
However… due to the significant increase in volume, this level will now be considered as an even greater source of potential resistance, should price once again return here. A large number of traders chose to trade in this region. Some will be trapped long, praying for their drawdown to provide a breakeven exit if price gets back to the resistance area. Others, who missed the initial move will be waiting patiently for a retest, and a second opportunity to enter short. Note the retest at I, also offered more stopping volume. Entry short, whether through anticipation or a pattern based entry trigger, offered significant opportunity as point’s H and I provided the high of the day. Look through your own charts to find similar examples. Identify sudden increases in volume. Consider the context within which that is occurring. Consider how this will affect the feelings of other traders – those profiting, those taking a loss, those who missed the move and those who hold on desperately in drawdown hoping, wishing and praying for a chance to get out at breakeven. And then watch to see how these feelings impact upon their decision making, and upon orderflow, should price later return to the area. So that’s it… nice and simple. But it’s not yet complete. That is the only volume pattern which I consistently take note of at the moment. I expect there will be more in future, as I grow as a trader. Stay tuned for continuation… (one day).